With Metro Vancouver’s Organic Waste Disposal Ban, a Composter and Solar Cone may be the perfect things for you to take care of your food waste in your own backyard! 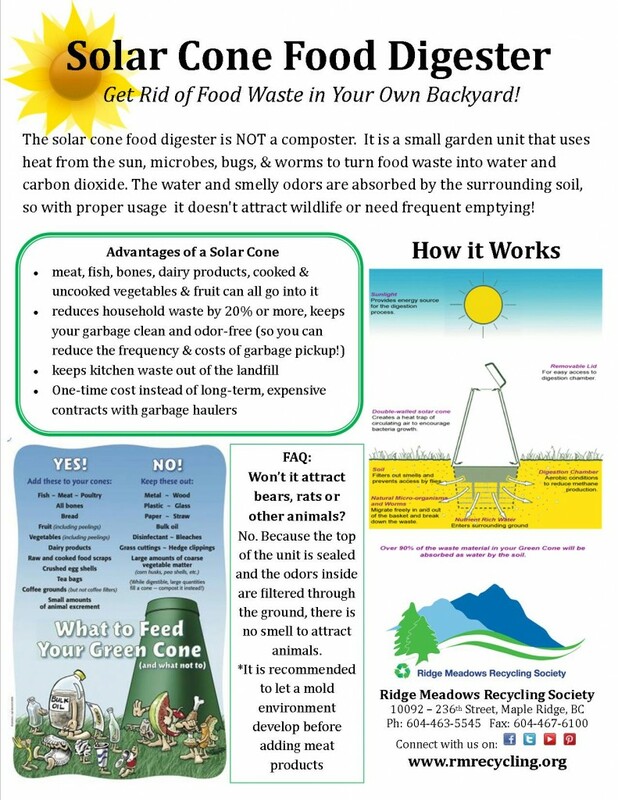 Back in 2008, Ridge Meadows Recycling started a pilot project testing the Solar Cone Food Digester (including in Bear country!). The pilot project was so successful, we offer them for sale to residents on an annual basis every spring. 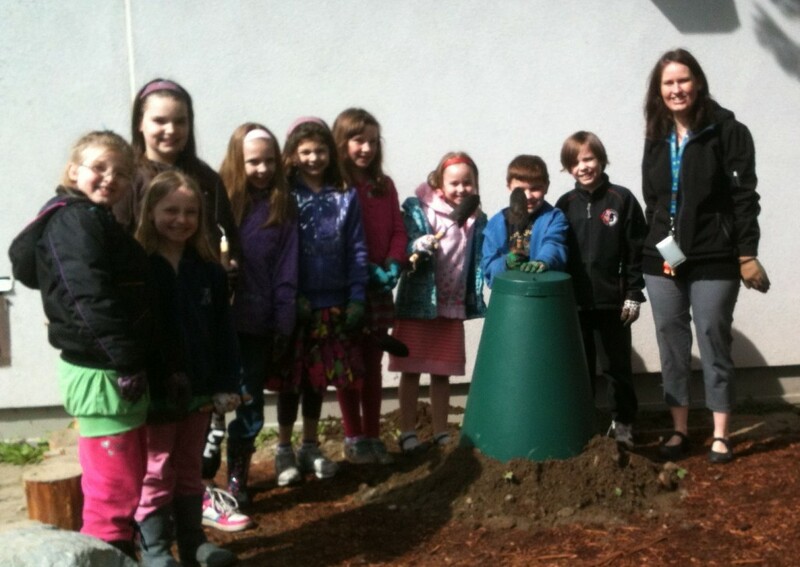 The solar cone food digester is NOT a composter. It is a solar-heated garden unit that safely reduces food waste (including meat, fish, bones, dairy products, cooked & uncooked vegetables & fruit) to their natural components of water, carbon dioxide, and a small residue. Because over 90% of its contents are absorbed as water by the surrounding soil, the solar cone does not need emptying and does not produce compost. It can ideally be used in tandem with a composter, composting uncooked fruit and vegetable waste & peelings and using the Solar Cone to dispose of meat, bones, dairy products, and other items that should not go in a composter. The solar cone has four parts – a lower basket, which is buried in the ground, a black inner cone that utilizes solar heat, a green outer cone which complements a garden setting, and a custom-fitted lid, which eliminates odors and deters animals. A plastic bucket with a filtered lid is provided for collecting food scraps in your kitchen and carrying them to the solar cone in your yard. The double-walled cone creates a heat trap of circulating air to encourage bacteria growth, while the soil filters out smells and keeps away flies. The dual cones capture solar heat and promote air circulation, which helps to grow micro-organisms and aids in the aerobic (“with oxygen”) digestion process. Residual waste is dispersed by insects, worms, and bacteria into the surrounding earth. A package of accelerator powder, a 100% organic and biodegradable enzyme, is included with the solar cone and can be used during the colder months of winter or in locations with more shade to speed up digestion. The solar cone should be installed in a convenient, sunny location as it uses solar heat to break down food waste – the sunnier, the better! Dig a hole 32” wide and 24” deep (add an extra 4” each way if you have poor drainage). Fill the bottom of the hole with a layer of gravel, small stones, etc. to aid drainage. Place the assembled solar cone in the hole, making sure the top of the black basket and the bottom lip of the green outer cone are below ground level. Backfill the gap around the base of the solar cone. If the top of the basket and the bottom lip of the outer green cone remain fully covered with soil, all odors are filtered through the earth and keep flies, rodents or other pests from being attracted to the kitchen waste. For more information, visit Great Green Systems. 1½ – 2 pounds (roughly one gallon) of food waste can be placed in your solar cone every day. over 90% of the waste material in the solar cone will be absorbed as water by the soil. 1. Proper installation – The entire bottom half of the solar cone, including the joint between the top & the bottom, should be completely buried and well-covered by dirt. 2. Proper start-up – For the first 2-3 weeks of usage, do not add any meat products. Wait until a mold environment is established before adding any of these attractants. This will also allow for the freshly-turned ground around the solar cone to compact a bit and seal in the odors. 3. Proper usage – Always seal the top lid with the catch and do not spill any food waste onto the outside of the cone or around the area where it is installed. If the seam between the top & bottom parts becomes uncovered, re-cover it with dirt and pack the dirt down.